Wales' Dominic Dale says he is proud despite his 13-12 defeat to Barry Hawkins in the quarter-finals. Trailing 11-5, Dale launched a stunning comeback which saw him win seven frames in a row and move within one of victory. It would have equalled the biggest comeback win (from six frames down) in a Crucible quarter-final. "I did my best but I didn't lose those last two frames, Hawkins won them," said Dale. 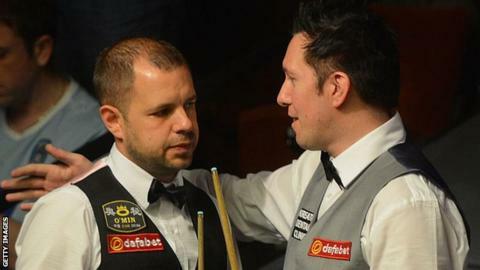 Hawkins showed great resilience to hold himself together, winning the final two frames with breaks of 66 and 65. The world number four punched the air in delight following his dramatic victory which set up a semi-final against Ronnie O'Sullivan. The overall record for a comeback at the Crucible is from eight behind, by Dennis Taylor in his 1985 World Championship final win over Steve Davis. Dale thought his fight back was a possibility when he made it 11-9. "When I won the fourth frame of the session that's when I felt it's pretty even," said Dale. "I've still got to beat him 4-1 from there. That's a big ask but I had so much momentum." World number 24 Dale reached the last eight for the first time since 2000, beating Michael Wasley 13-4. The 42-year-old had also beaten Mark Davis 10-5 in the first round and had to negotiate two qualifying rounds to make it to the Crucible. Nicknamed "Spaceman", Dale says he does not have any regrets, despite only needing one frame to win at 12-11. "I didn't think I played any worse or any better in those last two frames," said Dale. "But he just played magnificent snooker like he did in the first session to carry out a victory in the end. "He's a class act. I can easily see why he's world number four."